If you have a keyboard tray and you know how to type without looking at the keyboard, see if your keyboard tray can tilt forward. Tilting your tray forward 5-10 degrees will help to put your wrist in ‘neutral’ (from a side profile). If you ‘anchor’ your wrist to your desk while typing, flatten the legs on the back of your keyboard to improve your wrist posture. 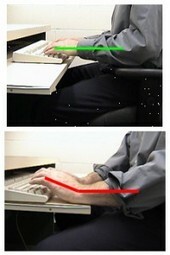 This helps you to avoid typing with the wrists bent backward. Make sure that you have the right equipment and accessories. If you can’t stop yourself from resting your wrists on your desk, use a wrist rest. REMEMBER: Wrist rests are to be used when RESTING, not all of the time! LOOK for wrist rests that are comfortable (e.g. gel) and not too high. Consider ‘ergonomic input devices’ (keyboard, mice) that promote a neutral/straight wrist angle. Ergonomic keyboards help by eliminating bending the wrist to the side while typing. Vertical mice help put your wrist in neutral (handshake) posture and eliminate anchoring. Doublecheck that your elbow height and keyboard height are approximately equal – helping to minimize awkward wrist postures. Adjust your mouse settings so that you can cover the majority of your screen without re-positioning your mouse.